This Lemon Butter Chicken Thigh Recipe is quick, easy and bursting with flavor! 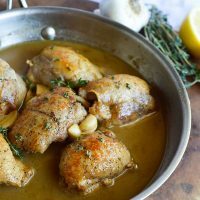 Juicy chicken thighs cooked with butter, lemon, thyme and garlic. The perfect one pan weeknight dinner! 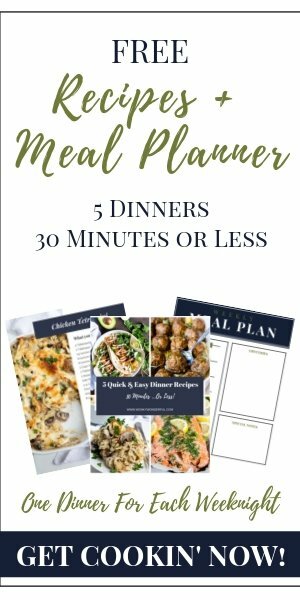 This 30-minute dinner recipe is gluten free, grain free, low carb and Keto friendly. This post was originally published October 7, 2015. How do I make chicken thighs? I typically eat chicken breast and every once in awhile I will change things up and have drumsticks. But the chicken thighs . . . they are just so darn juicy and flavorful. 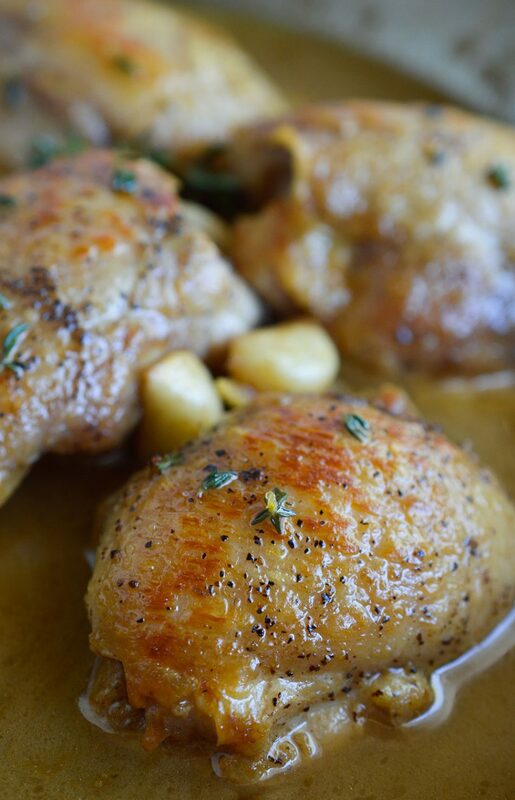 And this Lemon Butter Chicken Thigh Recipe with Thyme and Garlic will blow your mind! Pan frying chicken thighs is the best method, in my opinion. It gets a nice brown crust and you can finish the thighs in a great sauce. This recipe starts with Boneless, Skinless Chicken Thighs. I use the boneless skinless variety because I just do not like to bother with bones or skin. Plus they cook up a bit faster. How do you make chicken thighs crispy? Get that pan hot, hot, Hot! Make sure the pan and oil are nice and hot before adding the chicken. This tip goes for anything you are wanting to brown on the stovetop. In the mood for another great chicken dinner? What ingredients do you need for this Lemon Butter Chicken Thigh Recipe? This truly is my new favorite chicken recipe. It is not really surprising because lemon, garlic and thyme are a few of my favorite things. Not to mention BUTTER! Now if I could only find a way to add cheese to this dish it would be perfection. You will need a Sharp Knife, Good Cutting Board and Frying Pan. 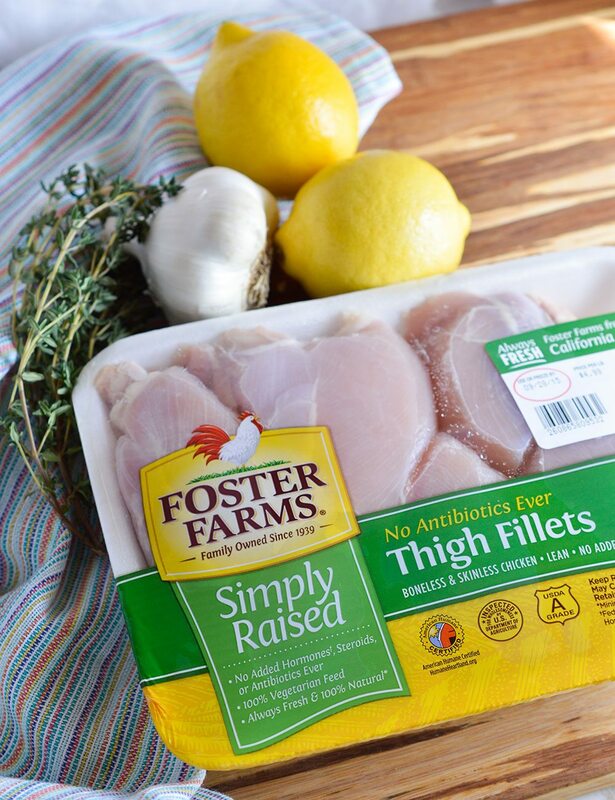 This Lemon Butter Chicken Thigh Recipe is quick, easy and bursting with flavor! Juicy chicken thighs cooked with butter, lemon, thyme and garlic. The perfect one pan weeknight dinner! Heat olive oil in large fry pan over medium/high. Generously coat chicken with salt and pepper. Remove chicken from pan and reduce heat to medium/low. Quickly add 1/2 cup chicken broth and scrape bottom of pan to deglaze. Add butter and garlic. Simmer uncovered 5 minutes. Return chicken to pan and add the remaining 1/2 cup chicken broth. Cover and simmer for 15-20 minutes. Baste chicken with liquid twice during this time. Remove lid. Add lemon juice and thyme. Prep all ingredients before you begin. This was an awesome recipe! Way more flavorful than expected. I added in steamed broccoli and spinach to make it a little healthier, and ladled the chicken and sauce over quinoa. I only wish there had been more sauce–I think next time I’ll add sauvignon blanc in addition to all the other ingredients. This sounds amazing! Going to try it tonight, I don’t have fresh thyme, dry will have to do. I’m going to make stacked potatoes with herbs, and Parmesan as a side dish. This was incredible. Simple, easy, yet packed with incredible flavor! Thank you! I just began cooking b/c I am in stage 4 CKD, but I have a foodies love for food and I like to eat out so I seek that quality at home. Your recipe was so easy quick and tasty. I added Mushrooms and onions so my broth came a little watery but my wife loved it anyway (she is prejudiced. She likes me… I think LOL) I used low salt College Inn Chicken broth. It was just so tasty even my somewhat finicky eater loved it and used bread to soak up the gravy! I don’t leave many replies like this but I just had to compliment you on a very nice recipe that was fit for the whole family and truly easy to make. Thank you! This recipe is delicious! I made it exactly as written and it was a hit! Thank you! I will be trying this today but i had a question in the recipe it says 2 filets i am using a package of about a pound of bones skinless theighs should i double or triple the ingredients? I’m always on the lookout for more chicken recipes to try out, I get tired of chicken really quick when I’m meal prepping so I have to constantly switch it up. This will be the next recipe I try, thank you!